1. Picco de Gallo: Or in Mexican terms, Salsa Fresca, it’s a salad you simply must try! It looks good and it tastes even better with its amazing blend of herbs and vegetables, you won’t be able to put it away! 2. 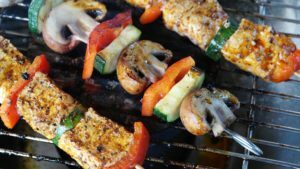 Mustardy grilled corn and sausage kabobs: You’re having a barbeque, everyone’s preparing the food, here’s a little something you can add. You don’t even need a lot to go about it and the best part? It’ll be ready in less than half an hour and of course, it’s delicious! 3. Paella Style Rice with Ham and Shrimp: Bring some seafood into your dinner with this recipe, guaranteed to make the whole family want more. Inspired by the Spanish Paella, it’ll definitely leave you with that amazing taste in your mouth! 4. Chipotle Maple grazed Tofu burgers: If you’re vegan, here’s something you can try. With the preparation time of just 1 hour, these burgers are mouth watering and delicious! Definitely worth a couple of hearts for your Instagram page as well. 5. Fresh Blueberry Cobbler: What are summers without desserts? Bake a Blueberry cobbler and serve it with ice cream. Your kids will love it, you’ll love it, everyone will beg for another slice. 6. No bake chocolate cookies: As the name suggests it, you don’t have to spend time near the oven for these, they’re healthy with oatmeal in them and the best snacks to munch on. Also, they have chocolate! There’s really nothing more to say about it. Don’t forget to try out these recipes and enjoy your summer with cold drinks and ice creams!